There are numerous features that one would desire from a hunting backpack. Of course, the most important is the ability for it to accommodate your essentials. You want the pack to have enough room for the gear you’ll need for the desired length of the hunting trip. If you’re going out for a day, then the pack must carry enough for your day trip. If they say it’s a daypack, then it has to carry like a daypack. If the manufacturer promises a size bigger than a daypack then that’s what you expect; a pack that can accommodate gear that will support you for more than a day’s hunting trip. But that isn’t all you want. You’ll want the pack to be comfortable to carry; you’ll want it to be strong to withstand the battery inflicted on it in the outdoors and of course, you want it to last you a lifetime. What if you had a pack that at least attempted to provide you with all these features in one? That’s right, all of them. Eberlestock has taken that leap and went ahead to create the X2 hunting backpack. It certainly argues its case passionately, presenting a plethora of features any hunter would enjoy having. So, let’s check how it stacks up facing the rest in this Eberlestock X2 Pack Review. One of those things you wait with bated breath to hear is whether the pack is going to fit your stuff. You must be asking whether it’s big enough. You need to know whether it’s got enough pockets and compartments. Well, the Eberlestock X2 Pack does present an array of pockets to secure your gear in. It has the main pocket which is accessed from the top. It also has pockets on the pads and waist belt. But that’s not all. To the side, there are pockets as well, the main side pocket being large enough to fit a rimfire rifle scope. If the pockets are too small for your larger gear, you can easily lash them onto the outside thanks to the compression straps. All these have been adeptly fitted in a pack that measures 22.5 inches by 16 inches by 6 inches. Notice how small its footprint is. Despite this compact nature, it still manages to pull off a carrying capacity of 1830 cubic inches. Still, having a weight of just 4 pounds and 8 ounces when empty, this pack leaves all the heft to the gear you’ll stuff inside of it. And we know that you’ll always fill it to the brim. Everything you need for your hunting expedition will surely find room either inside, in the compartments or outside lashed by the compression straps. There is, however, an effect to take it to its limit; the pack gains weight. That might be a burden when carrying, right? Wrong. The Eberlestock X2 Pack has an inbuilt tubular aluminum frame. Being made of aluminum, we know that the frame is strong enough to handle whatever weight presented to it. It won’t bend either will it break. Another advantage of the aluminum material is that it’s lightweight. And the last thing we want is more heft brought by the frame. So, take the frame’s strength and put it in a pack that’s carrying pounds and pounds of load. This frame ensures the weight is evenly distributed across the bag. Then, while carrying, it intelligently transfers the load from your shoulders and rests it on to your hips and waist. You’ll feel the difference and will hardly notice the Eberlestock X2 Pack on your back most of the time. So the pack is hanging behind you. You’re hiking to the hunting spot as the sun unapologetically triggers trickles of sweat to form on your back. The back is in contact with the Eberlestock X2 Pack which, by the way, is totally full. In other packs, this heft will cause an overheating of your back. In effect, the walk becomes utterly uncomfortable. However, X2 isn’t other packs. It was built with a full mesh back panel that’s padded to ensure comfort while carrying. This back panel is separated from the main pack by an air gap. That’s right! There’s a big air gap in the space between back panel and pack. In this gap, air flows freely allowing warm air generated to flow out and cool, relaxing air to flow in. The result is your back will remain cool and dry throughout. The prime feature of the Eberlestock X2 Pack is this, the Flex Chassis. This is what apart it from other hunting packs in its category. You might be wondering what this is, right? Well, this feature is found at the bottom of the X2. You’ll notice that the bottom of the pack can flip forward, extending from the main body. Flipping it forward reveals it’s padded, soft nature and this can be used as a seat. But that’s not all. When you have large loads, you can still use this Flex Chassis to cradle the bulk onto it and secure it in place using the compression straps. It helps to carry extra gear on the outside. 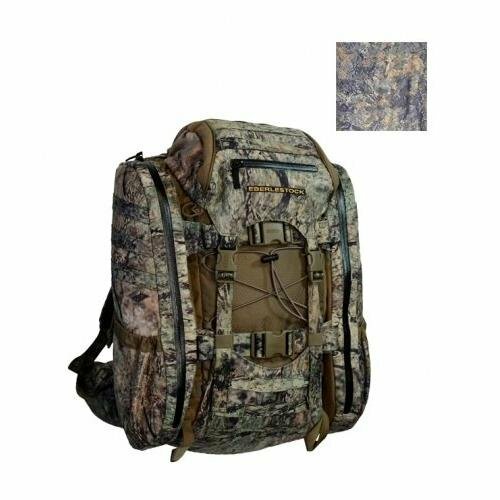 Then, the heart and soul of any hunting backpack is its ability to allow you carry your hunting weapons, keeping your hands free while walking. This was thought through in the X2. At the front face of the pack, there’s a pocket in which a compound bow can slide into. The bow can then be firmly held in place using the compression straps. You can also get yourself Eberlestock’s scabbards and attach them to the pack. These will snugly fit a shotgun or a full-scale hunting rifle, whichever you use. The Eberlestock X2 Pack is compact and lightweight. Despite this small build, the pack manages to carry a capacity of 1830 cubic inches. The compression straps found on the X2 allow for the attachment of larger gear on the outside. Being able to carry a massive load, the pack is fitted with an aluminum frame to ease the carrying of such a weight. Eberlestock’s Flex Chassis feature allows the lower portion of the pack to flip forward and be used as a seat or cradle for loads attached externally. This pack is compatible with Eberlestocks scabbards which can carry a shotgun or full-scale hunting rifle. This pack’s size is too small to fit individuals taller than 5’8” as the torso length isn’t adjustable. Q: What color options does one get with this pack? A: You can select the Hide Open Rock Veil color, Hide Open Western Slope color, Hide Open Timber Veil color, Loden color or the Multicam color option. Q: How long of a warranty does Eberlestock give? A: They give an amazing lifetime warranty. Q: Is the pack H20 compatible? A: Yes, it certainly is. Q: Does this pack have a dedicated meat pocket? A: No, unfortunately, it doesn’t. Q: Are the scabbards bundled with the X2 on purchase? A: No, they’re sold separately. This Eberlestock X2 Pack no doubts an ideal daypack. Its size is compact and very light belying the ample carrying capacity it bears. The numerous pockets are designed to securely hold your gear without you having to worry about them getting damaged. We also love the fact that Eberlestock included a frame. And it’s not just any kind of frame; it’s an aluminum frame. Then, the icing on this awesome pack, the Flex Chassis. This gives you a comfortable place to take a load off. This pack impresses and it’ll certainly impress you.